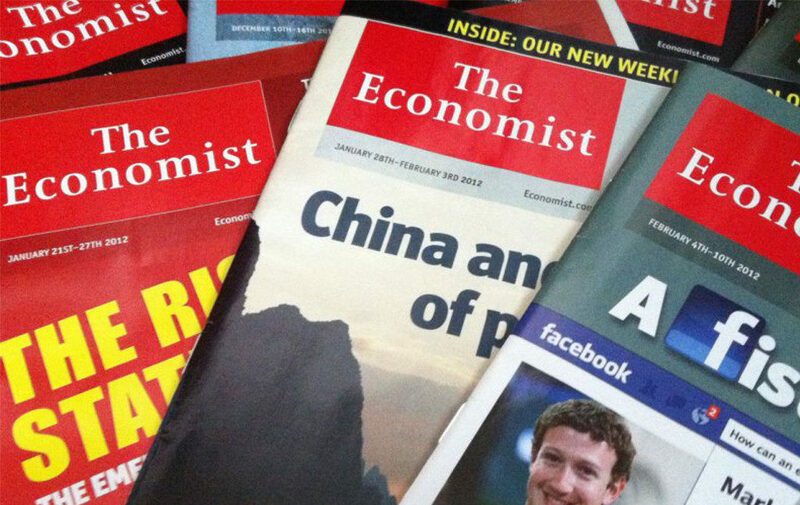 Is it fair to trash The Economist? You bet it is. 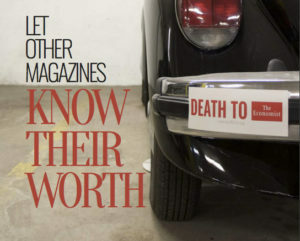 Current Affairs is well-known for its signature “Death to The Economist“ bumper stickers, which have greatly improved the expressive capacities of the American motorist when it comes to demonstrating a discerning taste in periodicals. But, occasionally, members of the public send us adverse feedback on our vehicular adhesive strips. “What,” they ask, “is your problem with The Economist? Why be so rude? 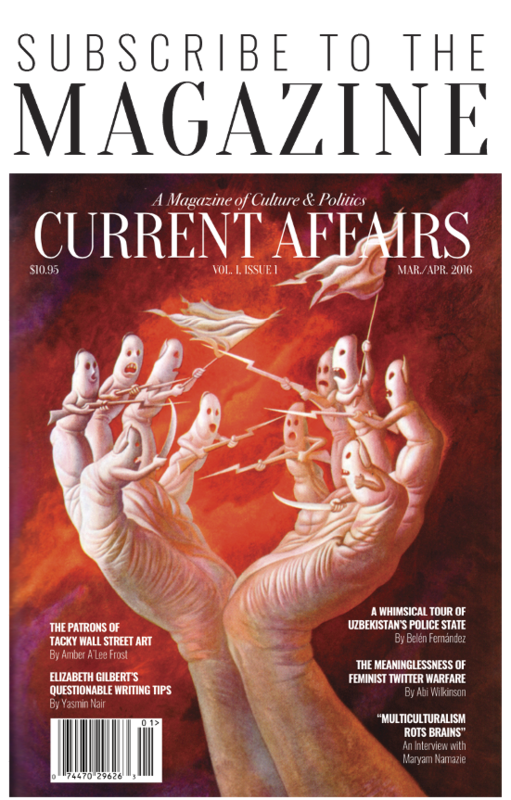 How can you wish death upon a perfectly innocuous and respectable British political magazine?” Current Affairs, it is said, is behaving badly. We are being unfair. It’s true that death is an extreme consequence to wish on another magazine, even if the magazine in question is The Economist. And sometimes I do wonder whether the sentiment goes a bit too far, whether it would be more fair to wish something like “a minor drop in circulation” or “a financially burdensome libel suit” on our London competitor. But then I remember what The Economist actually is, and what it stands for, and what it writes. And I realize that death is the only option. A just world would not have The Economist in it, and the death of The Economist is thus an indispensable precondition for the creation of a just world. But the most damning case put by Fallows is not that The Economist is snobbish and preys on the intellectual self-doubt of Americans through its tone of Oxonian omniscience. (Though it is, and it does.) Fallows also reveals the core flaw of the magazine’s actual reportage: thanks to its reflexive belief in the superiority of free markets, it is an unreliable guide to the subjects on which it reports. Because its writers will bend the truth in order to defend capitalism, you can’t actually trust what you read in The Economist. And since journalism you can’t trust is worthless, The Economist is worthless. Last summer, a government man who helps make international economic policy told me (with a thoughtful expression) he was reading “quite an interesting new book” about the stunning economic rise of East Asia. “The intriguing thing is, it shows that market forces really were the explanation!” he exclaimed in delight. “Industrial policies and government tinkering didn’t matter that much.” By chance, I had just read the very book—Governing the Market by Robert Wade. This detailed study, citing heaps of evidence, had in fact concluded nearly the opposite: that East Asian governments had tinkered plenty, directly benefiting industry far beyond anything “market forces” could have done. 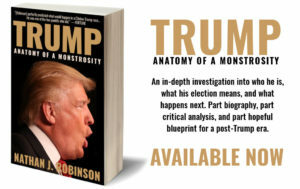 I knew something else about the book: The Economist magazine had just reviewed it and mischaracterized its message almost exactly the way the government official had. Had he actually read the book? Maybe, but somehow I have my doubts… The crucial paragraph of The Economist review—the one that convinced my friend the official, and presumably tens of thousands of other readers, that Wade’s years of research supported the magazine’s preexisting world view—was this: “The [Asian] dragons differed from other developing countries in avoiding distortions to exchange rates and other key prices, as much as in their style of intervening. Intervention is part of the story—but perhaps the smaller part. That being so, Mr. Wade’s prescriptions seem unduly heavy on intervention, and unduly light on getting prices right.” These few lines are a marvel of Oxbridge glibness, and they deserve lapidary study. Notice the all-important word “perhaps.” Without the slightest hint of evidence, it serves to dismiss everything Wade has painstakingly argued in the book. It clears the way for: “That being so . . . ” What being so? That someone who has Taken a First [at Oxbridge] can wave off the book’s argument with “perhaps”? Here, then, is the problem with the magazine: readers are consistently given the impression, regardless of whether it is true, that unrestricted free market capitalism is a Thoroughly Good Thing, and that sensible and pragmatic British intellectuals have vouched for this position. The nuances are erased, reality is fudged, and The Economist helps its American readers pretend to have read books by telling them things that the books don’t actually say. Now, you may think that Fallows’ example tells us very little. It was, after all, one small incident. He spoke to one man, who had gotten one wrong impression from one faulty Economist review. Perhaps we were dealing with an exceptional case. Presumably Fallows encountered this kind of thinking regularly, but perhaps he’s singling out the minor part of the magazine’s otherwise-stellar reportage and reviews. Let me, then, add a data point of my own. Until last week, I had not read The Economist since high school, where debate nerds subscribed to it in order to quote it to each other and prove themselves informed and worldly. But a few days ago, I was trying to compile a list of news outlets that Current Affairs staff should regularly glance at, in order to make sure we are considering a broad and ecumenical set of perspectives on contemporary geopolitics. I remembered Current Affairs’ ostensible rivalry with The Economist, and thought it might be a good idea to at least read the damn thing if we’re going to be selling bumper stickers calling for its execution. I am nothing if not open-minded and fair. It has even been argued that the opioid epidemic and the Trump vote in 2016 are branches of the same tree. Anne Case and Angus Deaton, both economists at Princeton University, roll opioid deaths together with alcohol poisonings and suicides into a measure they call “deaths of despair”. White working-class folk feel particular anguish, they explain, having suffered wrenching economic and social change. As an explanation for the broad trend, that might be right. Looked at more closely, though, the terrifying rise in opioid deaths in the past few years seems to have less to do with white working-class despair and more to do with changing drug markets. Distinct criminal networks and local drug cultures largely explain why some parts of America are suffering more than others. 25 years after Fallows wrote his Economist takedown, not a single thing has changed. The 1991 Economist used the meaningless phrase “that being so” to dismiss an author’s entire argument and conclude that markets should be left alone. The 2017 Economist concedes that “as an explanation for the broad trend,” economic despair “might be right,” but that “looked at more closely,” drug deaths are not about despair. “Looked at more closely” functions here the same way that “that being so” did: it concedes the point, but then pretends it hasn’t. After all, if despair might be the correct “explanation for the broad trend,” what does it mean to say that “looked at more closely” the trend isn’t the result of despair at all? It’s either an explanation or it isn’t, and if it doesn’t hold when “looked at more closely,” then it wouldn’t be “right” as an explanation for the broad trend. What happens when The Economist looks at opioid deaths “more closely” is simple obfuscation. The magazine shows that opioid use looks different in different parts of the United States, because the drugs themselves differ. For example, when it comes to heroin, “Addicts west of the Mississippi mostly use Mexican brown-powder or black-tar heroin, which is sticky and viscous, whereas eastern users favour Colombian white-powder heroin.” Note the subtle invocation of “free choice” language: heroin users in the Eastern United States “favour” Colombian heroin. It’s not just that this happens to be the available form of the drug; it’s also that they have a kind of rational preference for a particular form of heroin. Every subtle rhetorical step is toward exonerating capitalism for people’s suffering, and blaming the people and their own foolish choices within a free and fair marketplace. The Economist’s article on the opioid epidemic offers some legitimately interesting observations about regional variation in types of drug use. Increases in deaths have been concentrated more heavily in places where drugs are available in easier-to-ingest forms. The trouble is that The Economist argues that this implies the idea in the article’s subtitle, that deaths from drugs “say more about markets than white despair.” That’s just a conclusion that doesn’t follow from the provided evidence. The magazine’s own charts show that drug use of all kinds has been rising, meaning that the differences between usage types can’t account for the broad trend. The drug type differences can tell us why different places may experience differing levels of rises in opiate deaths, but they can’t tell us why so many people are now drugging themselves who weren’t before. And we can’t answer that question without considering economic class; opiate addiction has disproportionately risen among poor white people, meaning we have to find a way to understand what specific race- and poverty-correlated factors are causing the change. Why, then, have a “Death to The Economist” bumper sticker? Because The Economist would justify any horror perpetrated in the name of the market and Western Enlightenment values, even to the extent of rationalizing the original great and brutal crime on which our prosperity was founded. Its tone, as Fallows observed, is one “so cocksure of its rightness and superiority that it would be a shame to freight it with mere fact.” And the problem with that is not that The Economist is cocksure (I of all people should have no objection to cocksureness in periodicals), but that it doesn’t wish to be freighted with inconvenient truths. The fact that The Economist has a clear set of ideological commitments means that it will pull the wool over its readers’ eyes in the service of those commitments, which saps it of intellectual worth. It will lie to you about the contents of a book by waving them away with a “that being so.” Or it will reassure you that capitalism has nothing to do with opiate deaths, by asserting without evidence that when “looked at more closely,” drug addiction is “less” about despair. It will fudge, fumble, and fool you in any way it can, if it means keeping markets respectable. And it will play on your insecurity as a resident of a former British colony to convince you that all intelligent people believe that the human misery created in “economically free” societies is necessary and just. It will give intellectual cover to barbarous crimes, and its authors won’t even have the guts to sign their names to their work. Instead, they will pretend to be the disembodied voice of God, whispering in your ear that you’ll never impress England until you fully deregulate capitalism. So, then: Death to slavery. Death to injustice. Death to The Economist.